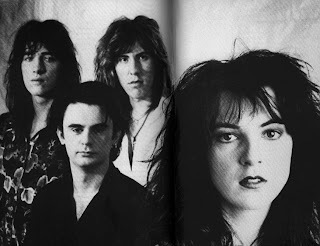 All About Eve are one of many bands who began in an indisputably goth mode but then gradually moved in other directions. Band members were associated at various times with Gene Loves Jezebel, Mission UK and Sisters Of Mercy, so goth credibility was not hard for them to come by. By the nineties the band had drifted quite a bit musically - which is not to say that the later music is bad - but in 1985 All About Eve debuted with a textbook example of the richness that, for a while, was goth. First single 'D for desire' is the opposite of a kaleidoscope: rather than fragmenting musical ideas in all directions, it crystallizes them in a pure focal point. There are obvious reference points for the song, but it has a purity of expression that exceeds its influences. Which is quite a statement, considering that the two most obvious references are Siouxsie & The Banshees and Cocteau Twins. Structurally, the band's original line-up mirrors Cocteau Twins: female vocalist, guitar and bass, and a drum machine. Even with a steady stream of programmed fill, the mechanical drum track on 'D for desire' is lifeless; instead of collaborating with the bass player to breathe life into the song, it is unyielding. In most cases this would drain the life out of a track, but in special cases it provides a useful tension - as the musicians strain against the lock-step of the machine, they display a more obvious vitality. Some Cocteau Twins tracks from the same time period do the same thing, and the watery guitar of 'D for desire' also bears a resemblance to Robin Guthrie's: instrumentally the song is a kissing cousin to 'Wax and wane' or 'Hitherto'. Rather than recalling Elizabeth Fraser, though, vocalist Julianne Regan sounds like an only slightly less dangerous Siouxsie Sioux, and her vocal arrangement on 'D for desire' takes a few plays from Siouxsie's book: lines that hover between speaking and singing, but suddenly blossom into full-throated syllables, repeated at the end of a line for emphasis. And one of Siouxsie's favorite concepts, the dark shadows of childhood legends, is used to the same chilling effect as it is on 'Spellbound' and 'Candyman'. See the roses growing purposely / dreaming of the vase... The song title has mislead us, and we will not be singsonging our way through the alphabet (was A for adoration, B for belief, C for care? Apparently not.) Only the darkest expression of desire will be addressed in this song: the intoxication of nihilism. The children are lost, questing for empty treasures that are destroyed as soon as they are found, and waiting like the flowers to be cut down in their prime. The only meaningful moment will be the pain before death, and as they seek it we cannot tell if they do it naively, as children play with fire, or if in fact they have no idea where they are headed, and all is the projection of our sadistic narrator, who howls and wails "desire" over and over until its meaning is forever changed. 'D for desire' is not a pop song. It's a pretty little abrasion that will bead up, scab over, and then itch deliciously for a week, begging us to scratch it open and start all over. Severed roses drawn, in their vases decay away / How they want pain, need pain, crave pain, love pain. We are appalled but we cannot deny the vitality. The pounding music never wavers and the narrator never relents, never shows any softness, giving life to a big evil that bursts the boundaries of her four minute frame. Few songs do it so well.